Day Now - Thank YOU! Day 40 - LET'S CELEBRATE! Account Deleted on Day Now - Thank YOU! Now peacefully focus on creating a state of Gratitude deep within you. As you begin to recognize the shift within, quietly give thanks for remembering the presence of this powerful tool for transformation. 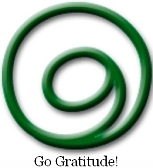 Creating harmonic waves resonating with others, too, who are now heart-fully focusing on Gratitude. 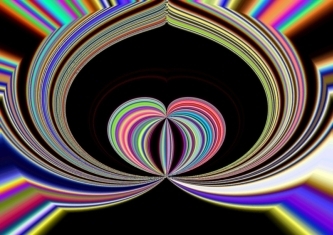 As each heart holds a pattern of Gratitude, a resonant wave begins to flood beyond our bodies -connecting each heart in harmony with the frequency of Gratitude ... creating interwoven fields, fractals of energetic transformation and doors of possibility between each being choosing to vibrate with Love and Gratitude. Just imagine what the surface of the earth might look like as we become standing waves, immersing ourselves, the planet, Yes! all creation in a hearty wave of Gratitude. ... a splendid happyning to manifest, indeed! "You create a morphic body of living coherence magnetically and sonically in the Earth. Thereby you create a literal resonance information path to deliver the information from the human heart into the Earth's grid and back. Sacred architecture would be in the language of biology's morphic resonance and structural stability. This is not just a large galactic mouthful to swallow from a little data set which says human feelings shape the Earth's field. This is what we all intuitively know in our own deeper heart. It is time to listen to the voice of our deep feelings from the heart. Learning to self-manage our thoughts and emotions is automatically "Earth grid engineering" and is not just saving the Earth; it is preserving our memory of the principle for making a collective and whole body, so that the planet Earth can take its true place in the universe, a planet of love and light." Members Page * Donate * Contact * Comment the Blog! My heart is almost exploding with gratitude!! !